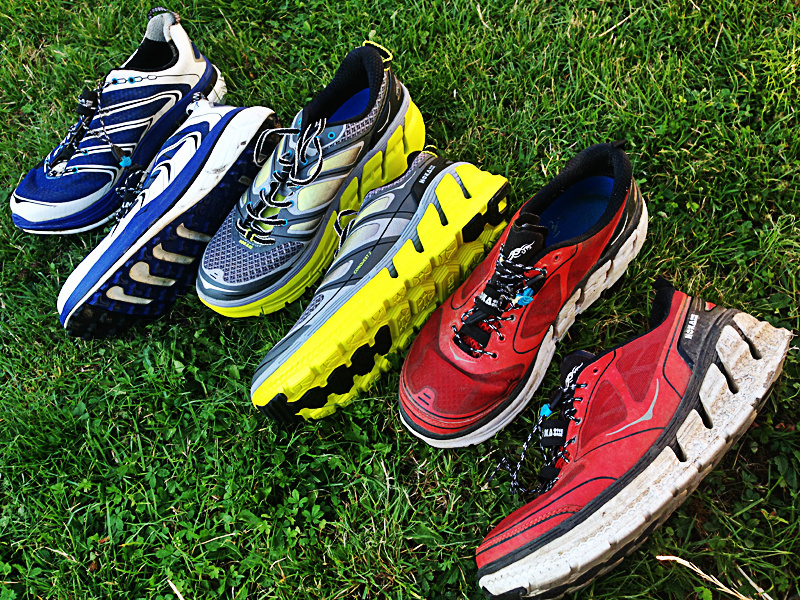 The subject of Hoka’s is one that can be divisive for runners. Since their introduction around 2010 there is no doubt that they have grown in popularity with the maximal cushioning design offering protection, support and comfort for runners. The blurb on the Hoka web page states “HOKA ONE ONE has engineered a unique performance midsole geometry that features a higher volume, softer density, and greater rebounding foam than standard running shoes. Along with maximal cushioning, this provides runners of all types with an energizing, stable ride. HOKA ONE ONE understood from the beginning that natural foot motion was extremely important for uniformity of stride. HOKA ONE ONE incorporated minimum drop geometry along with a rolling rocker design to promote consistent rhythm in the runner’s foot strike”. I was out in Florida last year (2014) and recall wandering around one of the huge shopping malls and out of interest visited a typical high street type running store. It was interesting to see that there was a large display of road shoes, only a handful of trail shoes were on display (although this may be a regional influence i.e. Florida is probably not the heart of trail running in the US) and then a huge display of Hoka shoes. The popularity of Hoka’s as a mainstream shoes particularly in the US to me was pretty evident. However, there is the high barrier to entry (the shoes are priced on the premium end of the scale) and there can be some derision over the look and feel (i.e. the ‘clown shoes’ type comments). For the past 12 months I have been trying out Hoka shoes, specifically the Hoka Conquest road shoe (I will comment briefly on the Hoka Conquest 2 and Hoka Rapa Nui trail shoe aswell). Essentially, this is a review of the Hoka Conquest which is now moving towards the end of their life. 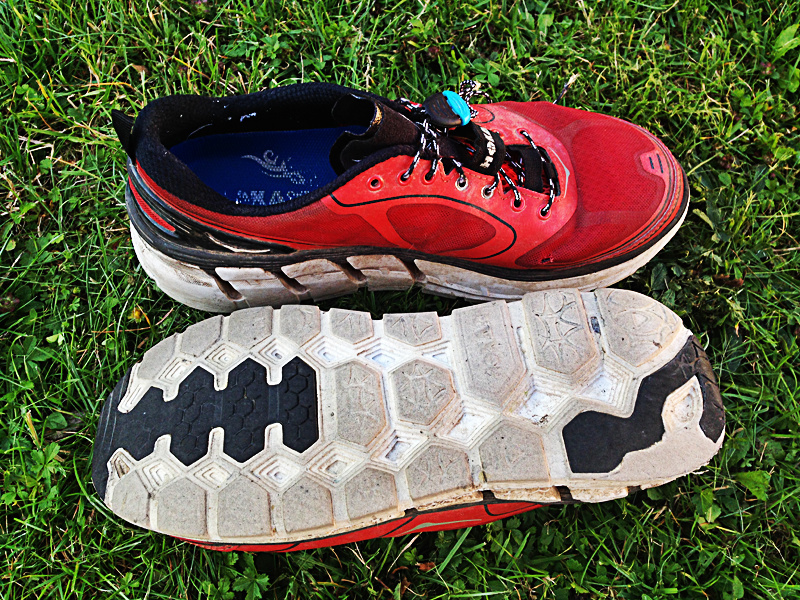 I have run almost 800 miles in this pair and I’m in a position when I think I can judge the performance of a shoe and how they worked for me as they approach the end of their life. I think the ‘how they worked for ‘me’ is the key point here as everyone has a different running history and style. The first question is why try Hoka’s? Essentially, I like supportive shoes and my 2014 year was plagued with minor knee issues and the majority of race reports probably featured a picture of me with Rocktape taped around my knees. The symptoms weren’t severe enough to prevent me running (i.e. knee pain) but there was some discomfort (i.e. stiff , sore, aching knees). I know Gemma Carter is probably going to read this and ‘tut’ at me a lot but I didn’t really rest as much as I should have (you could have guessed that) and I tried to manage these symptoms as best I could whilst running. The maximal cushioning and supportive nature of the shoes were considered an option to help me manage these symptoms. I was conscious of the size (perhaps this was just the stigma of wearing big shoes) at first and wondered whether this would affect my running style in terms of grip and nimbleness… I then realised that I hardly ever run quickly over technical ground that required a lot of grip and nimbleness. The Conquests didn’t feel especially cushioned in terms of the comfort of my feet and the inner soles, although the comfort and support would be evident over time. The heel height was 29mm and forefront 25mm giving it a 4mm offset and they weighed around 330g which isn’t much more than my typical road shoes. After 12 months use there is some evidence of wear on the outside edge of the heels (linked to my running style), the tie up laces eventually snapped and there was a minor hole on the top of the feet cover off but after close to 800 miles I feel like I’ve had good use out of them and there’s still a few more miles left in them. 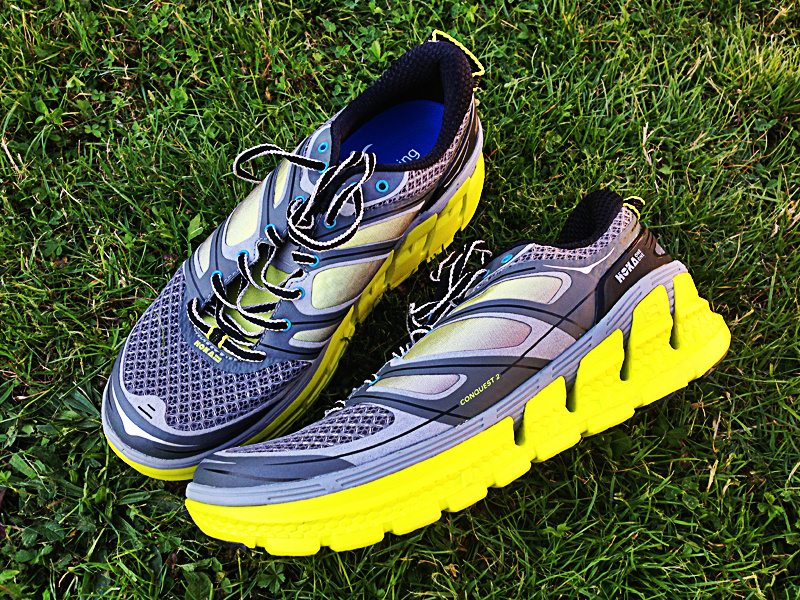 So what did I think of the Hoka’s and have they helped with my running? The answer is a simple yes, the cushioning and support of the Hoka’s has lived up to the expectation for me and I will provide a few specific examples. After several months of knees troubles I eventually took a little bit of time off in November 2014 (admittedly a planned complete month to six weeks of no running was shorted to two weeks and then I got twitchy and started running again. At the start of January I started to run some regular mileage and as soon as I increased the volume of miles I could start to feel the tell tale signs of knee ache again. I switched to the Hoka’s when I was building back up to my regular mileage and I didn’t suffer the symptoms I had when wearing other shoes. 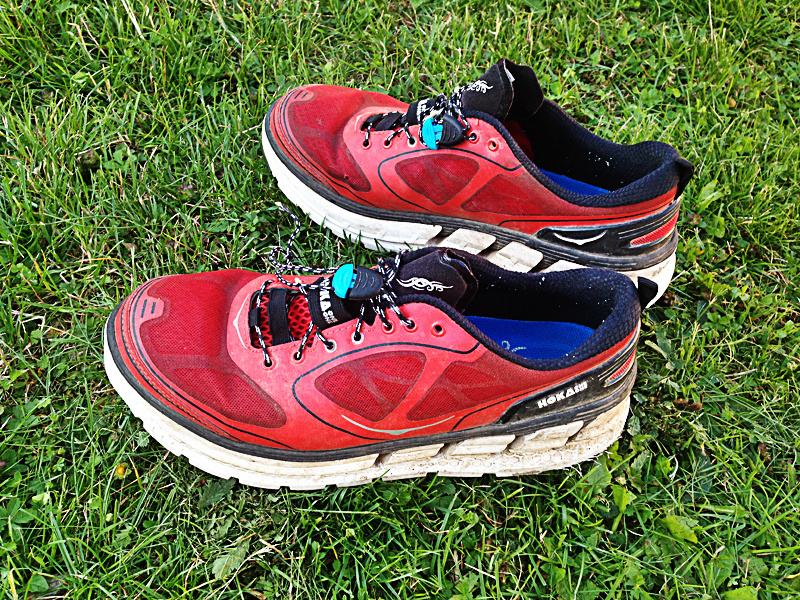 At the 2014 Winter 100 event, I swapped my Inov Race Ultra 290’s at 50 miles for the Hoka Rapa Nui. The reason for this was that I tended to suffer sore feet on the Ridgeway leg (having run the Ridgeway Challenge a couple of times) particularly with the stoney ground. I recall coming into the checkpoint having run a decent first 50 miles and was starting to experience the usual stiffness and soreness in the legs and feet. After putting the Hoka’s on there was a marked difference in how comfortable and cushioned my feet felt. I’ve recently been running some high mileage weeks in preparation for Spartathlon which has involved running lots and lots of runs and multiple runs per day. I have focussed on regular consistent mileage with easy days but not really had any rest days. On a couple of occasions there have been some early signs of knee-ache and the use of the Hoka’s as a recovery shoe (particularly after a marathon event the day before) has helped ensure this has not progressed any further. Overall, there is definitely a place in my armoury for Hoka’s primarily for use during the latter stages of a long ultra or as a ‘recovery shoe’. However, there are definitely times I wouldn’t use them (i.e. 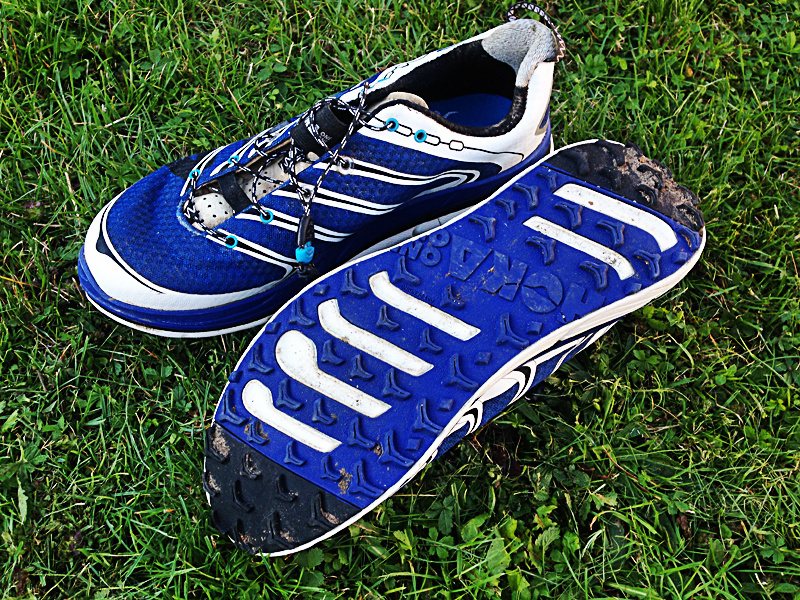 technical trail terrain, shorter road races etc) although I am planning on using the Hoka Conquest 2 at Spartathlon. This was an event where I suffered bloody feet and battered quads last time (to the extent that it was painful to run) and the additional cushioning of this shoe (aswell as more training miles and road miles!) should ‘hopefully’ help me in September. Overall, it was a positive experience for me as you can see I now own multiple pairs. If you are interested in Hoka shoes then these are available for sale at the ULTRAmarathonRunningStore. There is also a good web page here which can help point you in the direction when trying to determine which model you should be considering.